Unfold 1 pastry sheet on a lightly floured surface. Roll the pastry sheet into a 12-inch square. Cut into 16 (3-inch) squares. Repeat with the remaining baking sheet. Place 1 piece ham in the center of each square. Brush the edges of the squares with the egg mixture. Fold 2 opposite corners to the center over the ham and pinch the edges firmly to seal. 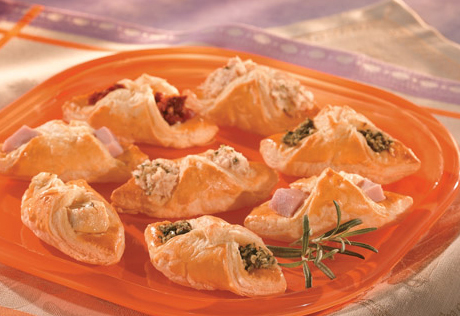 Place the filled pastries onto baking sheets. Flavor Variation: Make a variety of different pastries using any of these additional filling options- Place one of the following into each pastry square: 1-inch chunks pepperoni, 2 teaspoons ham or chicken spread; 1 teaspoon cream cheese (plain or flavored) and 1 slice jalapeño pepper or green olive, 2 teaspoons seafood or whitefish salad, 1 teaspoon prepared pesto or chopped oil-packed sun-dried tomatoes, 1 small marinated mushroom or 1-inch piece marinated artichoke heart.